Email marketing databases naturally degrade by about 22.5% every year. A 5% bounce rate can get you blocked. You don't have to worry when using our email checker tool! TheChecker offers email address verification solutions that improve data quality, deliverability, and email marketing ROI. We've developed an email verification tool, which has one of the best deliverability rates and speed on the market. 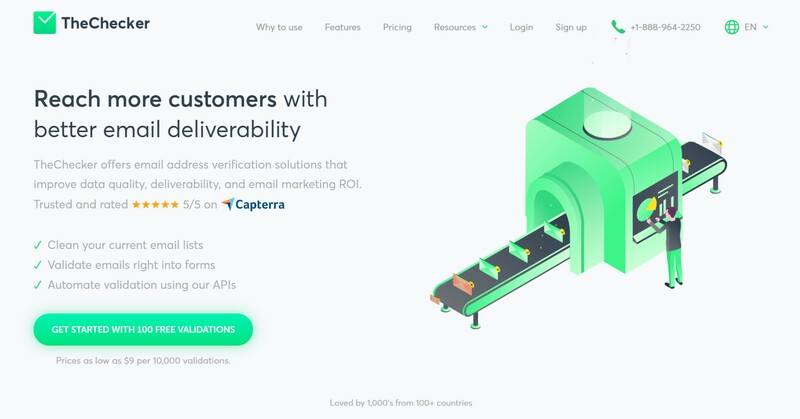 We have a web app that verifies email lists, a copy-and-paste integration that you can add real-time email verification to any website and an API to run bulk or single email verification straight on the web and mobile applications and to the development of white-label versions. Various features and facilities: 1. Email bounce checker: Identifies and tells you which emails will bounce and thus are not safe to send. 2. Global compatibility: We validate emails of all types and all major providers from anywhere in the world. 3. Catch-all checker: Checks for domains that are catch-all, which return valid for all emails. 4. Email typo correction: Suggests a possible correction for misspelled email addresses (@gmial.com => @gmail.com). 5. Syntax validation: Fully cleans your email list from email addresses with syntax errors. 6. Domain validation: Marks all the emails containing inactive or invalid domains. 7. Mailbox checker: Validates the existence of MX records for every email address. 8. Risk validation: Identifies and marks all the emails which domain accepts any email in their domain. 9. Free de-duplication: TheCheckers email checker tool removes all records containing duplicate emails. 10. Spam trap remover: Our email verifier tool removes all address identified as a spam trap. 11. Disposables checker: Checks against our frequently updated temporary email database. 12. 99%+ TC Guarantee: Our emails marked as "Valid" are covered by our deliverability guarantee. For more information, visit our website.